Websites based around Adobe Flash, are sometimes required, for their dynamic content. 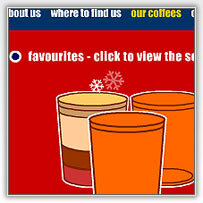 Outline: Goodbean, an up and coming chain of coffee shops which needed to present to a young 20 - 30 something audience, required a main company web presence. Brief: Fresh were asked to design and produce the site and as well as a regular html based site, they wanted the main site to be based around Flash. Approach: Discussions with the company marketing team were held and the market sector was discussed. A variety of graphic designs and website structures explored and through a series of iterations the overall look and feel were developed. Result: A strong Flash based website was produced and promoted by GoodBean which received excellent feedback and use by their customers and customers to be. NSC Global - Sales Presentation When this up and coming outsourcing specialist wanted to impress at a major presentation they came to Fresh. Sometime you need to tell everybody from your bosses to your suppliers and beyond what your vision is for the future.